I don’t mean to be a bad person. I’m just weak. We were in Boston and while Suzen attended a conference, I was off exploring. We have two wonderful cookbooks, Flour and Flour Too by the most talented Joanne Chang. She was in graduate school, began baking and what do you know: cookbook author, master of a chain of cafes in Boston, wife, mother. My mission was to find one of those cafes and sample. I searched, I found, I grazed, and I was amazed. I bought two of these cookies to take back to our hotel room. The room and the café were a long, long way apart. So, I did eat one of the cookies on the way back. That left one for Suzen. Did I say the hotel was a long way off? That it was was a cold day? That I was hungry? Still? “One bite? You saved me one frigging bite?” Back in that hotel room, Suzen was a tad upset. She had eaten her one bite of cookie that made it back — and in my defense it was a generously big bite. “The cookbook version had better be damn good,” she said. It is damn good. 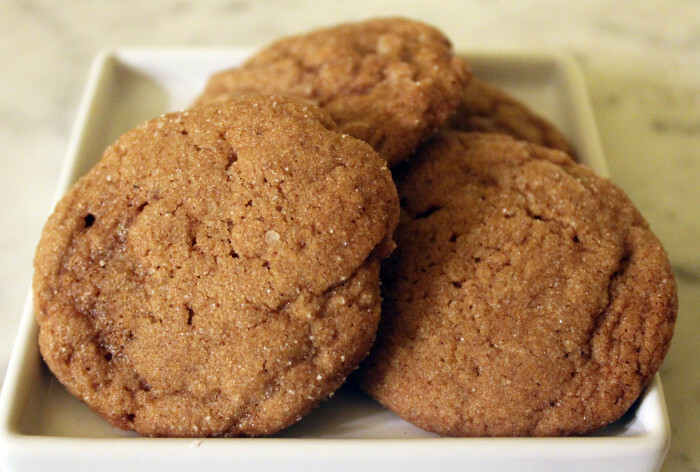 This recipe will give you exactly the cookie from the café. It’s as good as a cookie can be. Since we returned from Boston, I’ve made two batches. Suzen is a little less incensed. Personally, I think she’s dogging it for all its worth. The spice amounts here may seem small, but Joanne believes in balance and subtlety. Your first time out, use these proportions. Second time, you can balloon on the cinnamon or ginger. Do use the best quality molasses you can find, dark as midnight, rich as rum. Using a stand mixer fitted with the paddle attachment (or a handheld mixer or a wooden spoon), mix together the butter, brown sugar, molasses, and egg on low speed for about 20 seconds, or until well combined. In a medium bowl, stir together the flour, baking soda, ginger, cinnamon, salt, and cloves until well mixed. Add the flour mixture to the butter-sugar mixture and stir just until the flour mixture is totally incorporated and the dough is evenly mixed. For the best results, scrape the dough into an airtight container and let it rest in the refrigerator overnight (or for at least 3 to 4 hours) before baking. When you are ready to bake, position a rack in the center of the oven, and heat the oven to 350 degrees F.
Place some granulated sugar in a small bowl. One at a time, scoop out '/4-cup balls of the dough, place them in the sugar, and roll gently in the sugar to coat on all sides. Place the coated balls on a baking sheet, spacing them about 2 inches apart. Bake for 16 to 18 minutes, or until the cookies are crackly on top and just barely firm to the touch. Let cool on the baking sheet on a wire rack for 5 to 10 minutes, then transfer the cookies to the rack to cool completely. The unbaked dough can be stored in an airtight container in the refrigerator for up to 1 week.